Gone are the days when earphones and bottled water were considered the only essentials for running. With the marathon season and events slated ahead, a guide on how to be a well-equipped runner would be of much help. 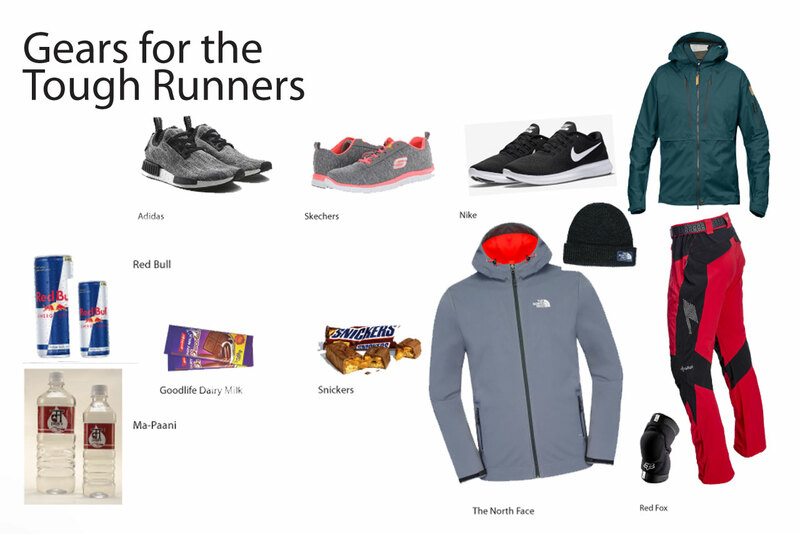 Marathons are not everyone's cup of tea, strenuous training goes into being a good,well-prepared marathon runner.I've realized how essential the correct gear is to making every last mile bearable. So if you're planning on being a marathon runner, see if switching or adding to your gear will help you go the distance. Picking the right pair of shoes is crucial for a marathon runner. Your choice can depend on the terrain or the place you will be using the shoes. To avoid foot cramps, blisters, and skin-torn toes, we have a list of brands that ensure proper fit and foot support. These brands will carry you across the finish line with comfort and ease. When it comes to unlimited sports potential, Adidas running shoes will make sure that you remain on top of your game. With award-winning models like the Adidas Energy Boost and Adidas Adipure Gazelle under its belt, the shoe brand’s dedication to providing a blend of performance and style in every run is obvious. From cushioned platforms, Skechers low drop and Skechers minimalist shoes allow runners to run low without losing support and cushioning altogether.Skechers race shoes are known to be great for competitive running, so investing in a pair will be a wise decision. Nike running shoes are designed with innovative features and technologies to help you run your best, whatever your goals and skill level. For a minimalist-type shoe, try Nike's natural styles. The cushioned running shoes are plush for a softer landing, and responsive styles are both lightweight and springy. In general, you need to drink water and consume carbohydrates during runs that are longer than one hour or ten kilometers. For shorter runs, you are unlikely to need to eat or drink, unless it is very hot, in which case you may need water to prevent dehydration. One way to minimize dehydration is to ensure that you begin a long run fully hydrated. In the days before a big race, it is a good idea to drink as much water as you can to keep your body hydrated. These brands of drinks might be quite a help for you. Energy drinks are beverages that contain some sort of physical or mental stimulant. Their consumption is very high among runners, and also with those involved in doing strenuous tasks. Red Bull as an energy drink has been popular among youth who are into hectic lifestyles and require a boost of energy for playing, working, and partying. When you have finished running, you should aim to refill the fluid you have lost by drinking enough water. Among the dozens of bottled water brands in the market, Ma-Paani seeks to stand out in the crowd with its brand theme and quality. Whether you’re looking for a way to show off your fashionable side while running, or just want to find a great fit for a comfortable run, these clothes brands can have you covered. For over forty years, The North Face has provided an authentic solution to the real needs of the athletes. The North Face gears are engineered with flash dry- XD technology that keeps you dry, and wont snag, pill, or pull. The materials are designed to stretch, flex, and move with your most rigorous workout. Red Fox hasachieved recognition from the world's leading mountaineers, professional athletes, and ordinary outdoor enthusiasts.Red Foxhas repeatedly been the winner of the "Sports Brand of St. Petersburg" award, and also received high marks in the contest “Made in Russia”. It's important to reload your carbohydrate stores during runs of ninety minutes or more. The body can only store around 2,000 kcals of glycogen, and after a few hours of running, your fuel tank warning light will flicker on, unless you frequently top up your carb stores. Made using the best Ghana cocoa on highly sophisticated machines,Goodlife Dairy Milk Chocolate is delicately soft and silky. This chocolate has been launched at an extremely pocket friendlyprice and size, which can be a great carry while running. The primary ingredients in a Snickers bar are chocolate, caramel, fluffy nougat filling, and peanuts. There are many other ingredients, as well, that make the recipe complete, and the candy bar, the supplier of enough carbohydrate you are going to need while running.